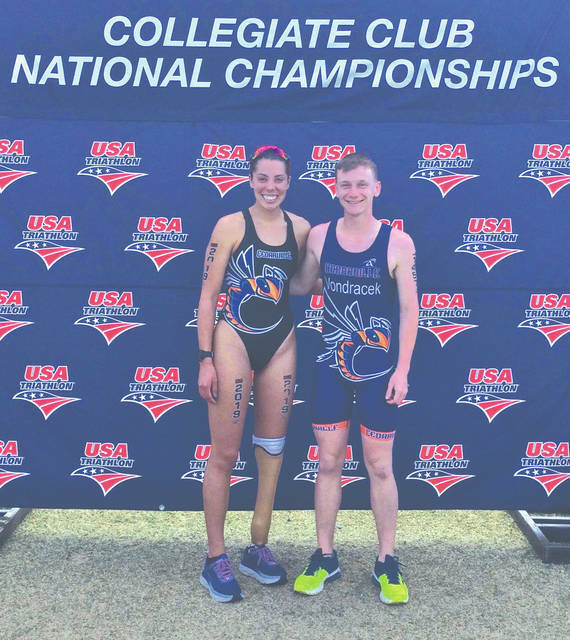 Cedarville University students Grace Norman (left) and Nolan Vondracek represented the school in the 2019 USA Triathlon Collegiate Club and High School National Championships, April 6 in Tempe, Arizona. Grace Norman leaves the bicycling exchange area and heads onto the running course, during the USA Triathlon Collegiate Club and High School National Championships, held April 6 in Tempe, Arizona. Grace Norman runs along Tempe Town Lake during the USA Triathlon Collegiate Club and High School National Championships, held April 6 in Tempe, Arizona. CEDARVILLE — Two Cedarville University students made some school club athletics history on April 6, as they were the first representatives on the Cedarville University Club Triathlon team to compete in the USA Triathlon Collegiate Club and High School National Championships in Tempe, Arizona. Nolan Vondracek, a recent graduate of Olentangy Liberty High School and now a freshman student at CU, competed in the men’s Olympic distance men’s triathlon, while world-ranked paralympian and Rio Paralympic Games gold medalist Grace Norman, a junior Yellow Jacket, was the only para-athlete competing in the Olympic triathlon distance in a field of 1,118 able-bodied runners. 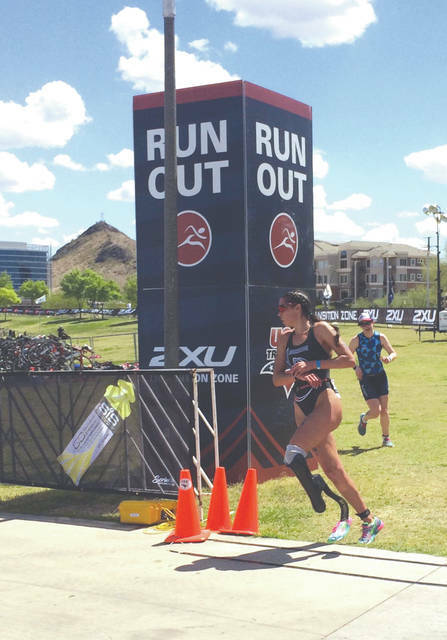 Race organizers placed Norman, a below-knee amputee, in the second wave of competitors since this was her first time competing in the Olympic distance. According to her mom — Legacy Christian track coach Robin Norman — she passed several of the women’s first-wave of competitors even though they started 10 minutes ahead of her. Norman covered the 1,500-meter swim distance in 22.06 minutes, bicycled the 41-kilometer (25.48 miles) riding course in 1:13.08, then turned in the women’s 21st fastest overall running time of 45.04 minutes over the 10K running course to place 26th out of a field of 477 able-bodied female collegiate runners. Her 2:25:21.0 finishing time placed her 288th in the overall field of 1,118 men and women triathletes. Vondracek represented Cedarville well in the men’s Olympic distance event, placing 393rd out of 641 male competitors. His overall time of 2:37:51.0 placed him 452nd overall. The Powell, Ohio native covered the swimming course in 27:26, biked the 41K course in 1:24.51 and closed with a solid running time of 40:46. Jack Felix, of Queens University in Charlotte, N.C. was the overall winner with a time of 1:55.18. The University of California Berkeley won the overall team title in the female division, while the U.S. Naval Academy triathlon team took the men’s team title. More than 106 collegiate triathlon clubs and four military clubs (Navy, Air Force, Marines and the Virginia Military Institute) competed in the annual event. The 2020 National Championships are also scheduled to be held in Tempe. https://www.fairborndailyherald.com/wp-content/uploads/sites/50/2019/04/web1_CedarvilleTeammates_PS.jpgCedarville University students Grace Norman (left) and Nolan Vondracek represented the school in the 2019 USA Triathlon Collegiate Club and High School National Championships, April 6 in Tempe, Arizona. Photos by Robin Norman. https://www.fairborndailyherald.com/wp-content/uploads/sites/50/2019/04/web1_NOrmanturn_PS.jpgGrace Norman leaves the bicycling exchange area and heads onto the running course, during the USA Triathlon Collegiate Club and High School National Championships, held April 6 in Tempe, Arizona. Photos by Robin Norman. 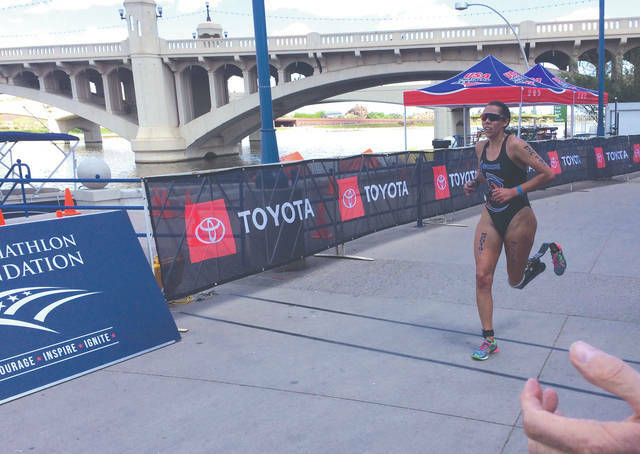 https://www.fairborndailyherald.com/wp-content/uploads/sites/50/2019/04/web1_NormanRiver_PS.jpgGrace Norman runs along Tempe Town Lake during the USA Triathlon Collegiate Club and High School National Championships, held April 6 in Tempe, Arizona. Photos by Robin Norman.